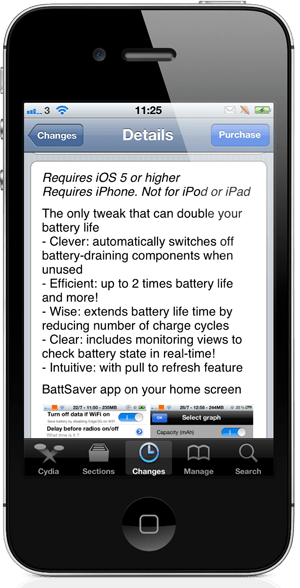 This is something which can only be achieved via Jailbreak tweaks….BattSaver for iOS 5 claims to double your battery life by continuously monitoring and switching off unneeded services and radios, thus saving battery juice. There are some battery management applications on cydia, but most of them either gives tips to save battery, or provide info about current processes using the battery. But BattSaver actually switches the radios and service as and when required which results in 2x the current battery life. BattSaver also comes with different presets (power strategies) that defines how aggressively the application saves the battery.